2 years ago ago by Region 22. 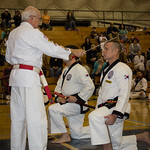 Three of the Region’s Sah Dan Instructors were promoted to the rank of Sah Dan Master at the 2016 Region 22 Regional Championship, held on April 23 rd at the Community College of Beaver County in Monaca, PA. Ms. Linda Russo, Mr. Tom Marker, and Mr. Adam Marsh were promoted during the Championship’s Opening Ceremonies, as competitors and spectators watched Grandmaster William Strong tie the Masters belts around their waists, and the three new Masters took the Masters Oath. Master Russo, Master Marker and Master Marsh all have 20 or more years of martial arts training, and have made significant contributions to their studios, the Region and to the World Tang Soo Do Association. Master Linda Russo, River Valley Tang Soo Do Academy, started training in college in 1991 under Master Mark Causerano in Philadelphia, PA, earning her 1 st Degree Black Belt in 1994. 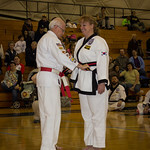 Graduate school took her to Nebraska where she continued her training and earned her 2 nd Degree Black Belt under Mr. Mark Eaton, Ft. Crook Tang Soo Do, who taught WTSDA classes on Offutt Air Force base. In 2001, Master Russo moved to the Pittsburgh area, and continued training at River Valley Tang Soo Do Academy, under Master Scott Homschek, where she earned her 3 rd Dan, 4 th Dan Instructor and 4 th Dan Master ranks. Master Russo continues to play an important role at River Valley, where she is an integral part of the instructing team for the youth and adult classes, and participates in the teaching of the River Valley Instructor Training program. In addition to her work in the studio, Master Russo has made extensive contributions at both the Regional and Association levels. She served for many years as the President of the Region 22 Leadership Class and as the Region 22 Scholarship Chairperson. Her contributions to the Scholarship Program include being the originator and facilitator of the WTSDA Masters Trading Card project. This project, originally proposed to Grandmaster Shin in 2004, has been very successful in raising funds for the Scholarship Programs across the WTSDA. Master Russo also has an extensive resume of participation at Regional and World Championships as both competitor and Judge. She has taught numerous times at local gup clinics, Regional Dan Camps and the USA Masters Clinic. In 2007, she joined Grandmaster Shin as an official member of the delegation that visited Korea and China. Master Tom Marker, Columbus Tang Soo Do Academy, began his training in 1998 while an undergraduate student at Ohio State University. He was one of the earliest of students to train at Buckeye Tang Soo Do, under the tutelage of Master Cy Genna. When Master Genna's work took him out of the Columbus area, Master Marker took over as Chief Instructor of Buckeye Tang Soo Do. In 2008, he was approached by the Licking County Family YMCA Western Branch to begin a martial arts program. At this time, he turned Buckeye Tang Soo Do over to one of his senior students, Mr. Mark Holtman, so he and his wife, Ms. Kelly Burke, could devote their full energies to developing the new studio. Since 2010, when Grandmaster Shin formed Region 22 out of the western half of Pennsylvania and Ohio, Master Marker has been a key part of the success of our new Region. He coordinates the Region 22 Black Belt Adult Camps and Youth Camps. Every aspect of the Dan Camps passes through his hands, and Master Marker and his team continue to dedicate their time and energies to making sure everyone has a successful Black Belt Camp experience. Master Marker also has a passion for photography and has provided his expertise at numerous Region 22 Dan Tests, as well as at the WTSDA World Championships. One of his areas of martial expertise, and the focus of his Master's Thesis, is Bong training. He was inspired by his instructor, Master Cy Genna, who was one of many Masters who were trained directly by Master Michael White of Appalachia Tang Soo Do. 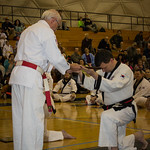 The staff was one of Master White's favorite areas of study and the traditions he passed to his students were shared with Master Marker, who continues to develop our knowledge and understanding of this traditional aspect of Tang Soo Do training. Master Adam Marsh, Virtuous Warrior Academy, began his martial arts training in 1991 in another Tang Soo Do organization and trained continually until 1997 when he enlisted in the United States Marine Corps. Before being honorably discharged in 2001, he earned the rank of Sergeant, having received the Sea Service Ribbon, Navy Unit Commendation, NATO Medal, Kosovo Campaign Medal and Good Conduct Medal. While serving, he continued his martial arts training, earning his Green Belt in the Marine Corps Martial Arts program and also completing the Marine Corps Close Combat Instructor Course. Upon his discharge from the Marine Corps, Master Marsh re-enlisted with the Army National Guard. His involvement with the National Guard included duty assignments with Homeland Security and deployment for one year in Kosovo. As part of his training with the National Guard he completed the Military Police Course. He was honorably discharged from the Army National Guard in 2008. 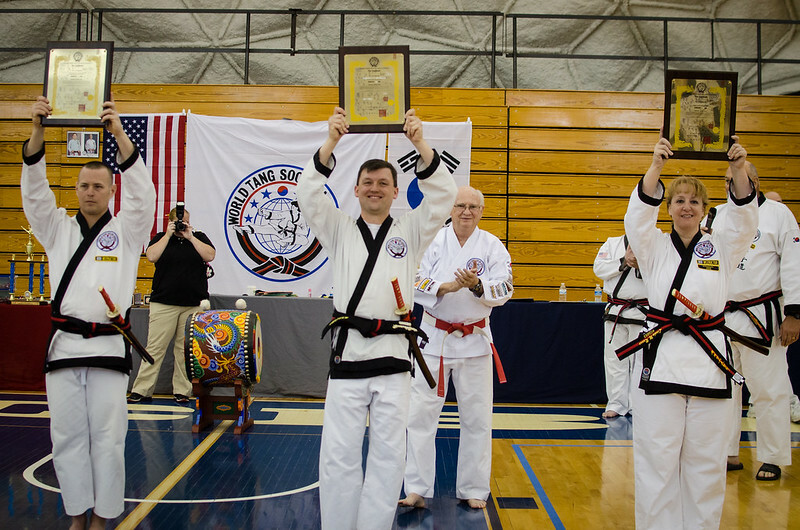 When he was not deployed for the military, Master Marsh continued his Tang Soo Do training as part of the other TSD organization, eventually earning the rank of 4th Dan Master in 2011. In 2014, he saw that his personal growth and development, along with his desire to become a studio owner, were not reaching their fullest potential under his previous instructor and organization. He began investigating options, contacted WTSDA headquarters, and was put in touch with the Region 22 Director, Master Scott Homschek. After numerous discussions and training sessions with Master Homschek, Master Marsh decided to formally join the WTSDA. This included taking a reduction in rank and beginning preparations to participate in the WTSDA Masters training and testing program. At the same time he was making the decision to join the WTSDA, Master Marsh and his wife, Shelly, purchased a building, began remodeling, and started his studio, Virtuous Warrior Academy in Somerset, PA. In addition to Master Marsh and his wife, their three boys, Alex, Isaac and Eli, all train in Tang Soo Do and are on their own paths to becoming Black Belts.